P-CMG programs are running now at Debney Meadows Primary School in Flemington, and at three primary schools in Greater Shepparton. Why are schools starting to offer P-CMG? What is the rationale from a school's point of view? What are some of the challenges for those working in, or overseeing, such programs? ​P-CMG program in Flemington Housing Estate when chance brought her into contact with Vicki Watson, principal of Debney Meadows Primary School nearby. ​Carole's Flemington Housing Estate program was pitched at isolated immigrant mothers of large families who had been in Australia for some time but whose lack of English skills was impeding their participation in society. Typically these women could not attend English classes because they did not offer child care. Carole and her colleagues had developed a P-CMG program that had a strong EAL flavour, supported by Moonee Valley Council, Jesuit Social Services and Cohealth. ​When Debney Meadows principal Vicki Watson first met Carole, she had recently participated in a Principals as Literacy Leaders professional learning program, and was contemplating what steps she and her school could take to address the language gaps revealed by the ﻿Australian Early Development Census﻿ for her school community. One of the goals of this Census is to "provide a catalyst to assist schools to develop productive relationships with providers of early childhood services in their community". It occurred to Vicki that the Flemington Housing Estate P-CMG program would be a good fit with her school's own needs, and so she offered Carole and her colleagues a room in the school where they could run the program. ​"As a principal, I have to know that all programs running at our school are aligned with our school strategy," Vicki says. 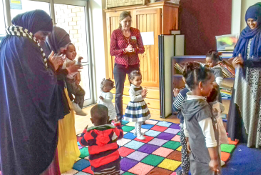 "One of our strategic goals is to build the oracy of pre-school children in our community. With its support for warm and responsive parenting, P-CMG is an excellent fit with the Victorian Government's Early Childhood Reform Plan: Ready for Kinder, Ready for School, Ready for Life." "Right now, around 60% of our children come from African refugee families who have experienced some level of trauma. They have been entering school with language skills two and half years behind their peers. I see our support for P-CMG as one element in a larger strategy we are pursuing to address that gap." For her part, Carole Pondevie-Lay has been very pleased with the support the school has given the program, whose ongoing funding continues to be provided by Jesuit Social Services and Cohealth. ​P-CMG program we ran inside the school should be open to mothers and children not connected to the school. Vicki agreed to that. She gave us our own dedicated room to work in, and hired a big skip to help us clean it out. Now we have our own space, and share the room with other community groups." ​In addition, Mandy notes that because P-CMG is free, and because no physical resources are required to continue the program at home, the program is an affordable tool for families in low socio-economic circumstances. ​"In P-CMG, we direct instructions towards the parent, teaching songs, rhymes and stories orally," Mandy says. "The children are also learning, but essentially the focus is on the adults acquiring the skills to take home and extend this learning with their child in everyday activities." "Our focus is on building the parent’s confidence and skills to empower them as their child’s first teacher. Though the program is in English, essentially the aim is to enhance language acquisition. If the model encourages ‘language play’ at home in the participants' preferred language, this is good. Language development in any language will enhance school preparedness." ​Mandy Salisbury agrees that staff at Debney Meadows Primary School have been very supportive of the program, and have always ready to help overcome any logistical challenges. ​"When you're working inside a school, you need to fit in with the timetable," Mandy says. "After discussing the timetable with the staff, we soon realised the best time to schedule our program would be after weekly assembly. That's when many parents come into the school. We also learned we need to end our program before recess starts. At recess we have many curious faces peering through our windows, many of them siblings who want to say hello! And of course we need to close our program down when students are not attending school — for example, on staff professional development days and school holidays." In Shepparton, P-CMG facilitator and Greater Shepparton Council employee Karen Mitchell has been developing a somewhat different model of co-operation that has seen schools in her area not only running P-CMG programs on site, but also funding their ongoing costs. "Greater Shepparton Council has long had an interest in enhancing the language development of young children," Karen says. "Quite some years ago, our Early Years Language Working Group identified P-CMG as one of several ways we could help ensure local children were meeting state-wide literacy and language benchmarks." P-CMG facilitator training for interested workers, provided each trainee's organisation agreed to certain conditions (see callout below). Today, many of those receiving facilitator training in Greater Shepparton work in schools. Parent-Child Mother Goose (P-CMG) is a weekly group experience for parents and their babies and young children which focuses on the pleasure and power of using rhymes, songs, and stories together. Parents gain skills and confidence which can enable them to create positive patterns and routines during their children's crucial early years, and give their children healthy early experiences with language and communication. There is no cost to the parents who participate. The program provides parents with the opportunity to connect with their child through rhyme and sound, based on the strength of secure attachment between parent and child. The feedback from facilitators and participants is always positive. Our aim is to offer even more programs across the municipality. As part of accepting this offer we require that all organisations / agencies agree to ‘release’ their trained staff member to facilitate a 10 week P-CMG program over the next 12 months. This program could be offered on site at your agency or held in another community venue. The Greater Shepparton P-CMG Co-ordinator, Karen Mitchell, will be able to provide support with advertising the program, taking registrations / referrals and other administration tasks. Excerpt from letter Karen Mitchell sends to organisations in Greater Shepparton that might be keen to run a P-CMG program. Greater Shepparton has previously offered half price training to those in their area who took up this offer. "Given the goals of our Literacy Program it seemed only logical we should approach local school principals and see if they would be interested in partnering with us," Karen says. ​"They're just as interested in boosting pre-school children's literacy and language as we are. I think they also find that running a P-CMG program in their school helps them to promote themselves in the community and gives them an opportunity to connect with some families who might otherwise not feel comfortable in a school setting." ​Like Mandy Salisbury at Flemington, Karen acknowledges that running a P-CMG program in a school has its challenges — but convincing teachers and principals to get on board has not been one of them. 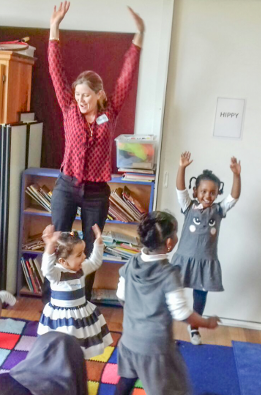 ​"Particularly when starting up a new program, it can take time to establish the kind of 'group culture' that does eventually evolve as more parents become familiar with the program, and attend with greater regularity," Karen says. "I believe it's important to offer a program on a continuing basis even when attendance numbers are low. If a school promotes the program in its newsletter, that's certainly helpful. Ultimately, though, the best advertising for a P-CMG program is word-of-mouth, and that takes time to build." Karen says she's found it's important to ensure each P-CMG program is open to all comers and is not restricted, say, to disadvantaged families. "We've found that groups work best with a broad range of participants," she says. At Mooroopna Primary School, eight minutes' drive from Shepparton, teacher aide Catherine Tricarico has been co-facilitating a P-CMG program in the school's Learning Centre for the last four years. Her school's program is open to all members of the local community, not just families with an existing school connection. Catherine Tricarico has been running P-CMG program at Mooroopna Primary School for four years. ​While Greater Shepparton subsidised the cost of Catherine's initial two day training as a P-CMG facilitator, her school covers the cost of her salary as she runs her weekly sessions every Friday morning. 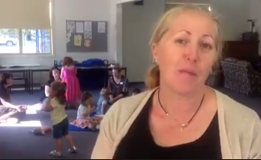 ​"Mooroopna Primary School offers P-CMG as a community service," Catherine says. "We're here to serve our community, and we take that mission to heart." ​Catherine says that in addition to herself and her co-facilitator (who is P-CMG trained, and works in the program as a volunteer), two teachers at her school have also completed P-CMG facilitator training. 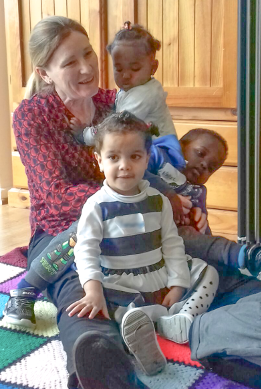 ​One of Catherine's greatest joys as a P-CMG facilitator has been to see her parents and children singing along to a new song they've only recently learned. "Sometimes it's just so obvious they've been singing this song together at home," says Catherine. "I love to see that." ​Another great delight of Catherine's is to hear an older child in school recalling fondly a rhyme or song they first learned in her P-CMG program. "Whenever that happens, I'm reminded how we're giving these children and their parents a gift they'll treasure for a long time," she says.